Start with the farro, rinse using a colander then place in a small pot with the water, vegetable stock and salt on high heat. Once boiling, set to a simmer for about 35 minutes, discard excess water and set aside to cool. For the vinaigrette, throw all ingredients in food processor or highspeed blender, blend until smooth. 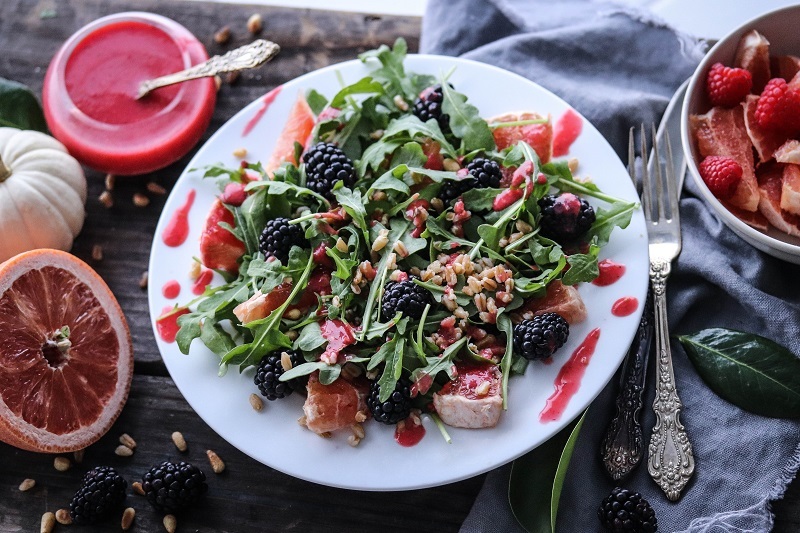 For the salad, toss arugula with the farro, peel and slice grapefruit and top along with the blackberries and pine nuts. Drizzle a generous amount of the raspberry vinaigrette and top with pinenuts. Enjoy!